SSC CHSL Recruitment: The Staff Selection Commission (SSC) is an autonomous organization that conducts several exams every year for the recruitment of various posts in various departments, offices, and ministries of Government of India. SSC CHSL Tier 1 exams to commence from 1st July to 26th July 2019. SSC CHSL (Combined Higher Secondary Level) is one such exam. SSC CHSL exam is conducted for the recruitment of Postal Assistants (PA) / Sorting Assistants (SA), Court Clerks, Lower Division Clerks (LDC), Data Entry Operators (DEO), etc. Every year, a large number of vacancies are announced by SSC for these posts. The level of competition too is very high as lakhs of candidates appear for this exam for the Government job. Candidates who are serious about cracking SSC CHSL exam must go through the entire SSC CHSL Recruitment Notification and know about everything about the exam. 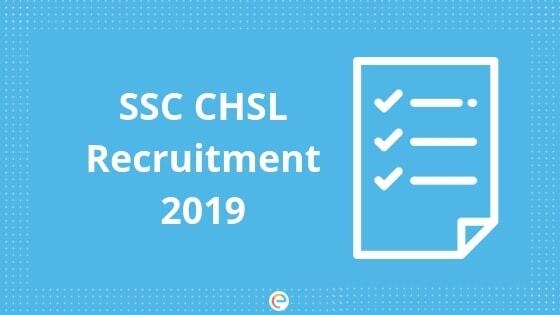 In this article, we will provide you with all the information regarding SSC CHSL Recruitment 2019. Latest Update: SSC CHSL Registration has started on March 5, 2019. The last date for submission of SSC CHSL Application Form is April 5, 2019. Apply here. Name of Posts LDC, DEO, Postal/Sorting Assistants (PA/SA), Court Clerk. 3.Educational Qualification: Candidates must have passed Class 12 or equivalent exam from a recognized board. For the post of DEO in the Office of Comptroller & Auditor General of India (C&AG), candidates must have passed Class 12 or equivalent exam in Science stream with Mathematics as a subject. SSC CHSL application form will be made available online on the official websites of SSC – ssc.nic.in and ssconline.nic.in. Candidates will have to fill up the application form and apply for the exam in the online mode only. How To Apply For SSC CHSL Exam 2019? Step 1: Login to SSC official website: ssc.nic.in or ssconline.nic.in. Step 2: There’s a “Login” window on the right side of the screen. You need to click on “New User? Register Now”. Step 3: You will be redirected to this page, where you need to provide your basic details, contact details and photo and signature as prompted. Step 4: Check the details and make corrections if necessary. Step 5: Submit the Registration Form. Step 6: Upon submission of the SSC CHSL Application Form, a Registration ID and Password will be generated. Note them down as you will need them in the future, be it for downloading SSC CHSL Admit Card or for checking SSC CHSL Result. Step 7: Once all the fields are filled, you will have to make payment of SSC CHSL application fee. Step 8: Your SSC CHSL registration will be complete only after successful payment of the application fee. After that, take a printout of your SSC CHSL application form for future reference. Fees can be paid using Mastercard/ Visa/ Maestro Credit/ Debit card or SBI Challan/SBI Netbanking. Both Photograph and Signature should be in JPEG format. The size of the Photograph should be between 4 to 20 kb. The size of the Signature should be of 1 to 12 kb. The time duration for the exam is 1 hour. There is negative marking of 0.50 marks for every wrong answer. The Descriptive Test, conducted in English and Hindi, is an offline exam, conducted in pen and paper-based mode. It tests your writing skills. The time duration for the Descriptive Test is 1 hour and the qualifying marks is 33 percent. The SSC CHSL Tier III is just qualifying in nature and the marks secured in this stage will not be considered for final merit listing. SSC CHSL Admit Card will be released on the SSC CHSL official website of the respective regions. Candidates will have to log in to their account using their SSC CHSL Registration ID and Password (as generated during online registration) to download their SSC CHSL Call Letter.No hard copies will be sent to the candidates. The SSC CHSL Hall Ticket will contain all necessary information about the candidate and the exam, including the exam center, date, and time. Now that you know everything about SSC CHSL Recruitment 2019, what are you waiting for? If you fulfill the SSC CHSL eligibility criteria, start your preparation for the exam. Finish the whole SSC CHSL syllabus as early as possible and start taking SSC CHSL mock tests. Taking the free bank PO mock tests of Embibe will be extremely useful for your preparation as SSC CHSL syllabus is more or less the same as that of the syllabus of bank exams. We hope this detailed article on SSC CHSL Recruitment 2019 helps you. If you have any query regarding SSC CHSL Recruitment, feel free to ping us. We will definitely help you out.